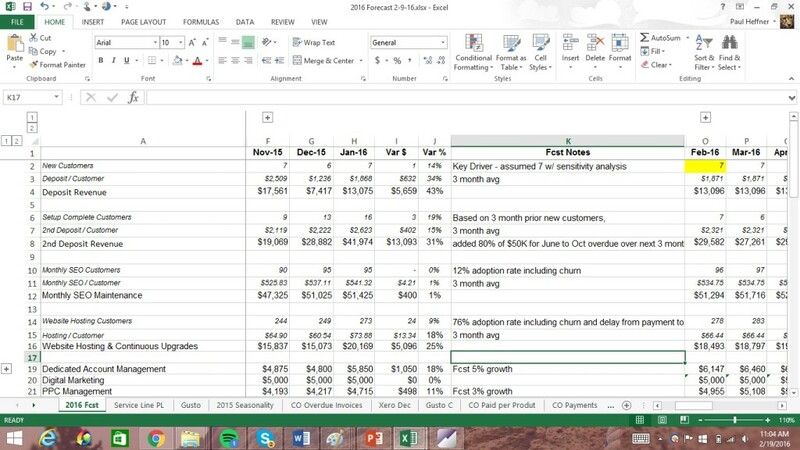 Finance Pals provides cash flow forecasting help for startups and small businesses. We help you figure out how to grow safely without having cash flow issues. We can determine when to hire new employees or how much to spend on marketing. We also help you understand trends and can uncover issues around not billing clients or needing to raise prices. Our first step to financial forecasting help is to accurately summarize all revenue and costs for the last month. We try to find the key drivers like number of new customers, number of existing customers and number of employees to understand what is driving the business. Then we look a the previous 3 months to understand the trend and find areas to investigate deeper to understand why certain revenue and cost buckets change month to month. It is very valuable to understand your profitability and cash flows when they change month to month. Then we build out a forecast for the next month or the rest of the year based on our analysis and your input around key areas. The annual budgets or forecasts help drive the business to meet targets around around sales. If you are growing company then a future looking forecast will help with valuation and help others to understand your business. We can also help you plan for future expenditures like taxes, insurance, employee bonuses, or other things that only occur a few times a year. Finance Pals is awesome at sensitivity analysis to determine a range of revenue, costs, and profitability. If you need financial forecasting help but are having a hard time determining how many new customers or what your profit margin to use for your model, then sensitivity analysis can help. We can also create business case models to help your company make smart decisions around large investments or changing the business direction.